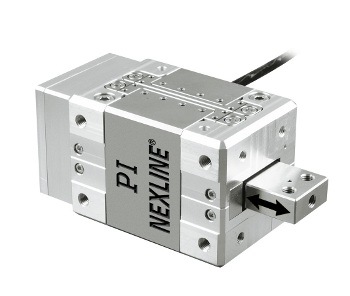 The N-216 NEXLINE® high-load linear motors are ultra-precision nanopositioning actuators with travel ranges to 20 mm and push / pull forces to 600 N (130 lb). The operating principle is based on coordinated motion of a number of highly preloaded linear and shear piezo elements acting on a runner and does not involve rotation/linear conversion. 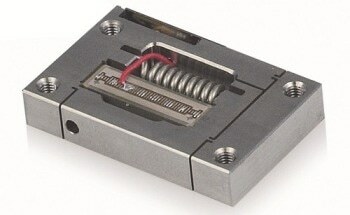 The working principle is non-magnetic, vacuum & clean room compatible. NEXLINE® drives have many high-end applications from ultra-precision manufacturing and semiconductor test equipment to astronomy and high energy physics applications. They excel when the requirements for high forces, precision, lifetime and stability are paramount. The extreme reliability makes them ideal for applications in difficult-to-access internals of instruments, where nanometer-realm adjustment and / or vibration cancellation are required. To promote long lifetime, the PiezoWalk® controller can reduce the operating voltage on all the piezo elements to zero at any position without affecting the full holding force (up to 800 N, 177 lbs).